very pretty card, Kymona, thank you for joining us at the Simon Says Stamp Challenge Blog!!!! 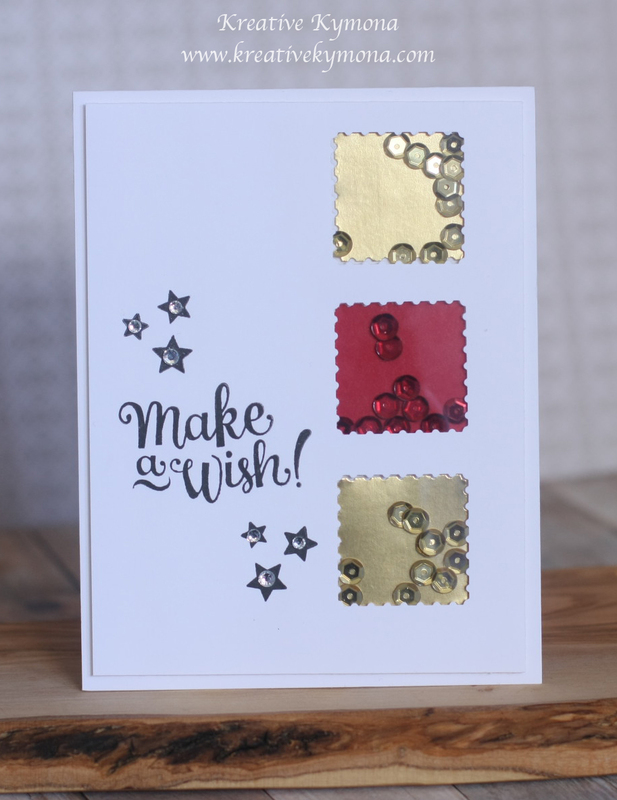 Gorgeous card Kymona, love the reds and Golds. Thank you for visiting my blog and leaving a comment. The die I used for my card is from Provocraft, its a cuttlebug die number1-1-0013.Its quite old so I am not sure they still make it! Hey Sally!! Thank you for your wonderful comment. Your welcome. Your card is so beautiful. I will check to see if I can find that die. Thank you! Hello Darnell!! I’m so glad and delighted that you love your birthday card. I hope you enjoyed your day and the rest of the month. Birthdays are always fun but this has to be so exciting. Yes, you will see me again. Totally wonderful card! Ok! Mission today is to attempt a shaker card. You have convinced me. Love your colour choice too! Lucky Darnell!!! Hey Hazel!! Thank you so much. Yes, yes, you have to try making a shaker card. It is really easy. You will love it. I can’t wait to see what you come up with. Hey Greta!! Thank you so much. It was really fun to make. Oh I so love the shine and shimmer of this shaker card 🙂 amazing ! Hey Deepti!! Thank you so much! I’m into shaker cards these days. I hope I get to make more of them. This is lovely! I like the gold and the red! Thanks so much for playing along with us over at the Shake it! Challenge on the Simon Says Stamp Wednesday Challenge blog! Fun, fun, fun and ultra cool card!! Love the sequins and the shaker factor!! You just really shined on this card!! Thank you Taunya!! Darnell even commented on the card!! That made my day. She loved it. I was so excited to see her comment. Oh I love the different coloured shaker squares, fabulous card. Hey Debby! Thank you for your kind comment. I recently started making shaker cards so when I saw this challenge I had to join in. Your Christmas shaker card is so cute. It looks like snow which is perfect around Christmas time. Thank you for having me. Hey Bev!! No problem! Thank you so much for your kind comment. Shaker cards are fun and they are best for birthdays. Thanks for having me at the party.